I like using skin-on chicken thighs because I quite enjoy eating chicken skin. 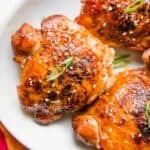 You can use boneless, skinless chicken thighs for the recipe as well. The chicken will probably be cooked sooner, so check the chicken at the 20-minute mark when baking. Add the rice, water, and pinch of salt to a saucepan. Bring the water to boil. Then, reduce the heat to low and cover the saucepan with a lid. Let the rice cook for 35 to 38 minutes, until all the water is absorbed. I use one of the smaller burners on my stove when I’m simmering the rice. Leave the pan covered until you are ready to serve. Preheat the oven to 400ºF. Position the oven racks to the upper third and lower third positions. Trim off any excess fat or skin from the chicken thighs. You don’t want to skip this step because the skin gets too chewy in you leave too much skin on the thighs. In a small bowl, mix the paprika, kosher salt, garlic powder, and black pepper for the chicken. Sprinkle these spices over the chicken thighs, making sure to cover both sides. Heat a large cast-iron skillet with the olive oil over medium-high heat. When the skillet is hot, add the chicken thighs, skin side down. Cook the thighs for 3 to 4 minutes, until the skin starts to brown. While the chicken is cooking, mix all the honey sauce ingredients together. Scoop out 2 tablespoons of the sauce and set it aside. Once the thighs have browned, pour the rest of the sauce over the chicken pieces and turn off the heat. Transfer the skillet into the oven (over the bottom rack) and cook for 22 to 25 minutes, until the thighs are fully cooked (they should be 165ºF when they’re cooked). Flip the chicken thighs halfway through so that both sides are cooked in the sauce. While the chicken is baking, prepare the broccoli. Break up the broccoli into smaller pieces. Toss the broccoli with 1 1/2 tablespoons olive oil and a small pinch of salt. Spread the broccoli over a lined baking sheet and roast in the upper rack for about 20 to 25 minutes. When you take the chicken out of the oven, you can baste it with the reserved honey sauce. If you have any extra, just toss it with the rice. Serve the roasted chicken and broccoli with a side of brown rice. Sprinkle the dish with toasted sesame seeds and scallions for garnish. Important note about the nutrition information: a lot of the fat from the chicken is rendered out during the cooking process, and you don’t actually consume all of the sauce used to cook the chicken. That’s why the nutrition information is a rough approximation. *If you do not have sambal oelek, replace it with 2 teaspoons of rice vinegar and 1/4 teaspoon red pepper flakes. You can also use sriracha instead.